Posted on March 17, 2015 by Mazur. 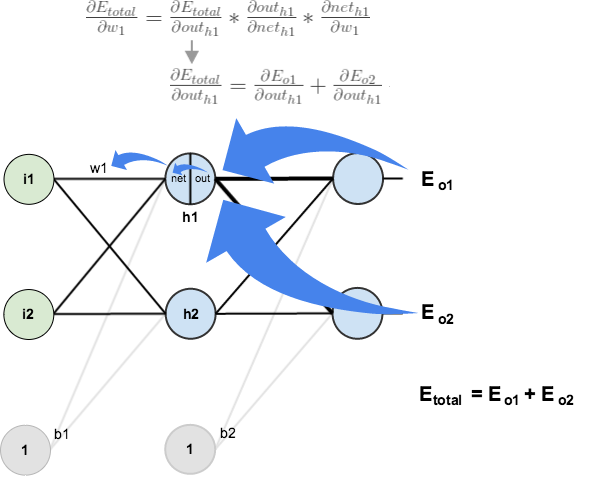 This entry was posted in Machine Learning and tagged ai, backpropagation, machine learning, neural networks. Bookmark the permalink. The labeling is slightly ambiguous because the weights were not put right on top of the links/edges. w2 is not going from i1 to h2, it is going from i2 to h1. That is, the weights are labeled to the left of their respective links/edges, not to the right. This is a little bit more obvious in the first graph. i use w3 instead of w2, since I2 is linked to H1 via w3. It really helped me to understand how back propagation works. Keep up the good work. Thanks Mazur for this numerical example. Such an example provides the best way to learn the working of an algorithm. It helped me a lot. Many thanks. Going through the example, I was wondering whether the biases b1, b2 are being treated as constants. Is it not necessary to adjust their values also? Yes. In this article, biases were treated as constants to keep things simple. If you understood the math explained in this article, you can easily update the biases as well. In reality, biases are also updated. Are we updating the bias values ​​by setting up the dE / db1 and dE / db2 chains? Great document, very pedagogic ! This explaination and visualization is very well understanding. It helps me so much because it takes me a lot of time to know how really backpropagation does. Thank you very much. Outstanding explainer for back propagation. Thanks, Matt! I was a bit frustrated with this backpropagation topic and was struggling to have a clear mental picture of backpropagation. Your article radically improved my understanding. Your article was so clear that I was actually able to write my own code to implement backpropagation. Thank you very much. Goog job! But this is 3-layer network only. If it is 4-layer then how we calculate the dEtotal/dout(h1)? dEh2/dout(h1) will not be know. Because we don’t have the value for dEh2 (the error for hidden layer 2). I need an explanation here. Thanks! You use the value that comes from the previous layer. For instance dE/dout i1 = dE/dnet h1 * dnet h1/ dout i1 = dE/dout h1 * dout h1 / dnet h1 * dnet h1/dout i1, in which dE/dout h1 and dout h1 / dnet h1 have been calculated by the previous layer. I got the same problem and I don’t understand the answer. Why is dE/dout i1 =dE/dnet h1 * dnet h1/dout i1? This ignores the contribution of out i1 to the error through h2!? So, I assume the term dE/dnet h2 * dnet h2/dout i1 needs to be added!? But then, why is it OK to just use the sum, mathematically? Question: do all neurons in a layer use the same bias weight or is there a individual weight per neuron? I.e. In the example it looks like that b1 is used for both hidden neurons and b2 for both output neurons. Btw: nice and easy to follow example! In reality each bias would be adjusted too, but in the example seems like they are only focusing on weights, and specifically the hidden layers. i think this is best explain backpropagation with detail kudos! Thanks a lot Matt for making this. Your blog and the Stanford’s CS231n lectures are the best resources on this. This page is very helpful to solve the problems. During the backpropagation, you find the new values for w5-w8 and continue backpropagating the previous hidden layer. There you need the value of dnet_o1/dout_h1, which equals w5. Do we use the original value of w5, 0.4, as it is done here or its updated value, 0.35891648 ? Backpropagation is based on previous forwordpropagation, so w5 should be same as original w5 rather than updated one. Thank you for explanation. I didn’t get one thing. Why we multyply by -1 derivative of totel error? is this because target is constant and out1 is function? Hey did you found why derivative for out1 is multiplied by -1 ?? You said in the beginning that we are going to work with only a single training set (1 row with 2 features ). Then how we are getting two outputs. It should be one right. Training sets can have as many inputs and outputs as you want. What the “1 row with 2 features” means is that there is only 1 training set in the entire list. For example if you input a (0,1), it will output a (0.5,0.5). For 2 ‘rows’ or training sets, you can have (0,1)->(0.5,0.5) OR if it is for example a (1,1)->(0.6,0.2). The row means a new ‘if’ statement. I am not sure what you mean by ‘feature’ if you’re talking about the amount of hidden neurons, the average between input/output neurons, or the amount of biases. I’ve got the same, is that right? aren’t weights supposed to be between 1-10? weights can be any number, but the larger the absolute of it is, the longer it will to calculate. This is an awesome post, I was confused about how the error propagates through the hidden layer. Working through each step made the equations seem intuitive. Someone should really make an animation for this. Hi Experts, I tried this approach, for some reason my weights and error keeps increasing, doesn’t seem to reduce for certain inputs, any idea whats happening ? I am not sure that it is right. Whether the BP should run far all the training samples or individual samples? Excellent explanation! Cleared my doubt. Great explanation. Thanks. Many authors who write books consider themselves as being smart just because they provide some complicated formulas from wikipedia with 10,000 different index symbols. But I do not think they are smart at all. They do not know their audience. This simple example is better than all books that I have which try to explain back propagation with fomrulas… I did not realize it is that simple. It is just taking derivative over and over again. Thank you very much! This is amazing, the best explanation I have found over the internet. Great job! Great explanation Matt. The best I have seen so far. Thanks, Very clear and useful. Thank you very much but I have a question. At the beginning w1 = 0.15, w2 = 0.2, b1 = 0.35 => How to initialize these weight, bias values. => How to nit matrix of Height, Bias ? Great explanation. I had no problem following your description, but I am missing a critical piece. In reality, we always have more than 1 row of inputs and outputs for training data (we could have hundreds of thousands of rows). How does this then affect the computations of the derivatives? I’m sure all training rows play into the total error, but I am missing what is probably a simple connection on calculating new weights in light of all the data. Can you explain how you would get the updated weights if you had two rows of training data? Do you process it one row at a time and then average the new computed weights together to determine the updated values? Is there a fast way to do this? Very good explanation. Thank you, it’s so useful for me. Now, the problem is on me, I must improve my math skill.